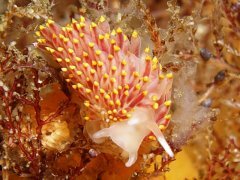 A possibly new species of Aeolid nudibranch species of Eubranchus, showing red colouration in the digestive tract extensions in the cerata. A possibly new species of Aeolid nudibranch species of Eubranchus, without the red extensions - here they are grey/white. 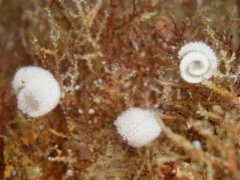 During a dive at Di's Cracks, a site close to Vulcan rock a number of small egg ribbons stood out. Investigating, two small (about 15 mm long) nudibranchs were spotted, first the "red" one because it stood out, then the white one. Researching through various indentification guides did not reveal this species, although other Eubranchus species looked similar. 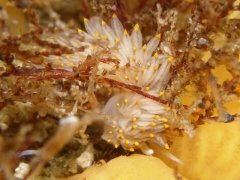 Posting to the Sea Slug forum did not result in a clear identification either, and it is now thought that it may be a new species, something confirmed by Dr. Terrence Gosliner. Unfortunately none were collected, and since the sightings (it had been spotted by Di Froude the day before Guido Zsilavecz photographed it), it has not been seen again. It was found at about 20m depth, on a wall, between hydroids. Nudibranchs of the Cape Penisula and False Bay. G Zsilavecz, 2007.